I was born to John Thomas and Fanny Braines Papworth on a cold wintery 6th of December 1899 in Peterborough, Northamptonshire, England. My mother always said I got in a hurry to be born before Christmas as I was not due until February of 1900. I was their third child and first daughter, and was so tiny at birth that my bed was kept close to a warm oven at all times. "My childhood was a happy one. Although we did not have many things money could buy, we were happy in the love that our parents provided. My mother was a sweet, lovely, spiritual lady with black curly hair and big brown eyes that could see right through you so you could never tell her a lie. My father, a Methodist minister, was stern and strict but fair. . . .
At the time of his birth, my mother was very ill and so the christening was neglected for the time being. At little Sidney’s funeral, the minister said that his soul would go down to hell and could not be redeemed because he had not received these church ordinances. This hurt so much, because in the Bible I had read where Jesus said, “Suffer little children, and forbid them not, to come unto me; for of such is the kingdom of heaven” (Matthew 19:14). . . . When I turned sixteen, I went to London. The First World War had been going on for a couple of years and I became a typist in the War Office. Miss Elsie Sigismund and I were chosen to be secret emissaries for the British government; our mission being to take messages from the military authorities at the War Office in London across the English Channel, a matter of about twenty miles, to those in charge of the British forces in France. Elsie was seventeen and I was sixteen when we were appointed to do this type of work, and we both felt it was an adventure and a thrilling opportunity. We were instructed that if captured by the German enemy, we were to destroy the messages by chewing them up and swallowing them. We were warned not to open and read them ourselves because it would make it more difficult for us if taken by the enemy and forced to talk. We were told not to speak with anyone, but to do the business at hand and return back to London headquarters. After we left Dover and arrived at Calais (pronounced Cally), we were usually met by two British officers who escorted us to the persons who were to receive the messages. We could easily have been killed by German submarines or counter-spies and had to be alert at all times. Some others who were working in the War Office were imprisoned and some were executed. One young man who met us at the boat in France turned out to be a German spy and was executed by the British authorities. I was sure that my Heavenly Father was taking care of us and we felt truly blessed. Even though we received a scare a few times, these trips generally passed by quietly and uneventfully. As a child I had been very religious, always searching for further knowledge of the Bible. During this period of time in London, I was still searching, often attending several churches on the Sabbath. One particularly lovely Sabbath day in May, I climbed to the top deck of a double decker bus and rode from one side of London to the other. Suddenly, my eyes seemed to cling to a sign over the door of a large building which read, "The Mormon Message to the World." It was the word "Mormon." Before leaving home to come to London, my parents had warned me against the Mormons. They were capturing young girls and sending them to Utah to be polygamous wives. I was a very adventurous young adolescent, so I got off the bus at the next stop and walked back to the building bearing the name of Deseret. It had once been a theater and the two top floors had served as a hotel. 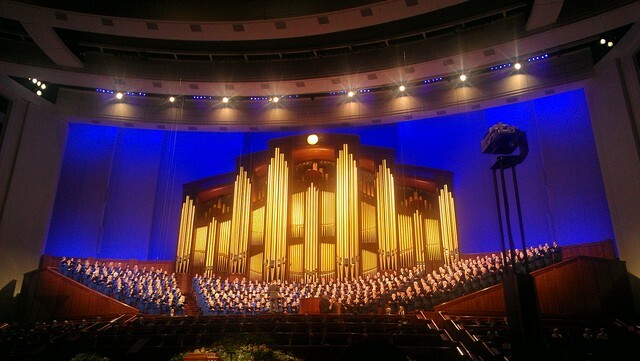 The Mormons were holding a conference in the theater section of the building where four hundred Saints from all parts of London were attending the Sunday School session of the conference. Edith Florence Papworth with her mother, Fanny Braines Papworth, and her little sister Emily Ada. This photograph was taken just after Edith’s sixteenth birthday, before she left home to work in the British War Office in London. British Mission President, Apostle George F. Richards, was presiding with about twelve missionaries as the speakers. As the Sunday School progressed, I watched little children singing, giving talks and poems and really participating in the meeting. This was wonderful to me, because in all the churches I had attended and investigated, children were seen but not heard. As a child in my Father’s Sunday School, I was not allowed to open my mouth. I enjoyed every minute of this “Mormon” Sunday School. I was invited by one of the Elders to have lunch in the large kitchen on one of the upper floors. His name was William Linford from Ogden, Utah.2 Taking his offer to stay for the afternoon session of conference, I saw babies blessed and learned that they were indeed children of our Heavenly Father, that they did not need sprinkling with water upon birth as they were innocent and straight from the presence of our Father in Heaven, and if they died before eight years of age, they returned again to His presence. I saw many people go down into the waters of baptism, some just eight years old, others in adulthood and one a sweet little old lady of eighty. This was indeed a thrill to me as I had never before witnessed such a baptism. I thought of little Sidney and what the minister had said about his soul going to hell because his parents had neglected to have him christened. I sat next to Elder Linford during the afternoon session of the conference and I recalled my mother’s words, “They get young girls and ship them to Utah,” so I was very cautious when answering Elder Linford’s questions. When I told him my name was Edith Papworth, he mentioned calling on a Mr. & Mrs. Thomas Papworth at Peterborough to gather genealogy. As it turned out, he was my second cousin and related to my mother on the Christian side of the family. Mariah Christian Linford was his grandmother, and she was my great-great aunt. He told me of his visit to my parents, and that my father had told him not to come back, that they wanted nothing to do with the Mormons. But my dear mother had been sympathetic toward William but dared not disobey my father. He was married with one wife and four children, so I felt comfortable with him. I was so thrilled with what I had seen and heard and I knew that my prayers had been answered and that I was indeed worshiping in the true church of our Heavenly Father. So I stayed for the evening session of the conference and after the meeting, was introduced to Apostle George F. Richards. Such a wonderful and inspiring man! . . .
Elder Linford escorted me back to my apartment and as we rode along on the bus, he told me more about the gospel. I was indeed filled with the spirit of the Lord. I knew for a certainty that this was the true church and that I had been drawn to these meetings. I attended the meetings at Deseret many times and whenever I met William, he always escorted me home. We discussed polygamy and he explained why the Church had accepted this practice from the Lord and the Manifesto which abolished it. He told me many wonderful things pertaining to the Church and I loved all of the teachings. I had a great desire to join this Church and I told my parents my wishes. Dad forbade me to do this and told me if I did that he would disown me. I returned to London and prayed for the advice of my Father in Heaven. Four days before my eighteenth birthday, I was baptized by Elder Linford and was confirmed the same day.3 I had learned very quickly that God does indeed hear us and guide us. My conversion started a series of unhappy events, but with the strength of my Father in Heaven I was able to overcome them. I knew that what I had seen and heard was the restored gospel. Apostle Richard’s explaining the gospel had stirred a spirit within me and I knew that this was the truth. I had seen a healing, heard stories of great faith and seen many other things done by the power of the Priesthood. I felt I had been washed and cleansed and was now a new person. As father had forbidden me to join the Church and my mother had pleaded with me not to do this and to stay away from “these people,” I was tormented. I remembered the commandment, “Honor thy father and thy mother that thy days may be long upon the land which the Lord thy God giveth thee.” I wrote to my father and told him of my prayers and subsequent conversion, baptism and confirmation and said I wanted to come home for Christmas. Our family had always been together at Yuletide, but he told me not to come. Somehow I couldn’t believe that he meant this, so on Christmas Eve, I went home. The last bus from the train station had gone, so I walked the two miles to our house even though it was late, around 11:00 pm. Mother and dad were sitting by the fire, having a late cup of tea. The house was decorated for Christmas and “home” looked warm and friendly as I looked through the window. I opened the door and walked in. Father turned and asked me what I was doing there. I said I had come home for Christmas. He ordered me out of the house and to never come back. I could feel the influence of Satan, but could not relinquish my chosen convictions to join the Church. Mother pleaded with him to let me stay, but he would not listen. Rather than cause any more trouble, I walked back to the cold depot in Peterborough and waited for the early morning train for London. Here I spent a dreary Christmas all alone in my tiny apartment. I thought over what I had done. It was the first Christmas I had ever been away from home and I missed my mother and my brothers and sisters and the wonderful Christmases we had always spent together. That day I wrote a long letter to my parents bearing my testimony to them and expressing my love for them, thanking them for all they had done for me and for my happy childhood. But I could not give up the gospel and my membership in the Church of Jesus Christ of Latter-day Saints. The weeks and months went by and I did not hear from my father. Mother wrote to me and I always answered her letters. Such a good and wise mother! Shortly after being baptized, I was called on a six-month mission with Zella McCready as my companion.4 We were sent to Gravesend, a shipping port at the mouth of the Thames River, where we labored without purse or script. The Saints were good to us there. Elder Linford had returned to the United States and I had a long talk with President James Gunn McKay, then President of the London Mission. He advised me to apply for my passport as I had a desire to go to Zion where so many of the Saints were gathering. This I did and received the forms to fill out. I was told that as I was not yet twenty-one, I would have to have my father’s signature. I sent him the papers and I should have known that something was wrong when father signed them and returned the forms to me with no objection. When I came home from the War Office a few days later, a detective from Scotland Yard was at my apartment. I was told to report at the old Baily Court on a certain day for trial for forgery under the D.O.R.A (Defense of the Realm Act). I was confused, hurt, so I got in touch with President McKay and he said to tell the truth and I would be alright. My parents came to London for the trial, which was brief, but my father stood by his statement that he had not signed the papers. I stood before the judge who was dressed in a black robe and wore a white wig and I was not afraid for I knew I had done no wrong. As I bore my testimony to the court and the judge, I heard voices singing across the courtyard. It was the choir of St. Martin’s Church practicing. The windows of the courtroom were open and as it was a warm day, the voices came through the window clearly, beautifully singing “Jesus, lover of my soul, other refuge have I none, hangs my helpless soul on Thee, Leave, Oh, leave me not alone, Still support and comfort me.” I had sung that hymn in church many times with my parents and I knew then that if I obeyed the will of my Father in Heaven, He would be close by. I felt that the judge knew I had done no wrong, but being a minor, I was sent home under the jurisdiction of my father for a year and had to report to the local police station once a month to prove that I was keeping the judge’s decision. I was getting discouraged because of father’s harsh treatment and I felt that I needed to talk to my Heavenly Father, so I went quietly into a grainfield close to home and asked Him to give me courage. I knelt in deep prayer and a feeling of peace came over me and I heard a voice speak to me telling me to be of great faith, that all was well with me and that I would get to Zion. I patiently waited for the year at home to end so that I could once again apply for a passport. Although Father made my life miserable, I enjoyed that year at home. I had learned that Satan can be very persistent and feel he certainly put in a lot of overtime on me. The minister of the neighborhood church held a prayer service on Sunday, praying to the Lord to save my soul, as I had strayed from the fold. When I sought my passport at the year’s end, my father did nothing to stop me. He said I was a stubborn girl. I retorted that I was not stubborn, just determined. The passport office in London contacted him to see if he sanctioned the passport this time and he replied, “Yes, let her go, and if she does not like it she doesn’t need to ask me for help.” I really thought he was the stubborn one but through the years since then, I can see it wasn’t stubbornness, but his love for me, because he truly believed that I was going to Utah to be a polygamous wife. On the first of October 1920, I left my lovely England and my loved ones, and sailed from Liverpool to Montreal, Canada, one of a group of converts. I was met in Salt Lake City by a young Mormon elder who took me to a friend’s home in the Salt Lake Twenty-Ninth Ward. The Frank Tolman family had expressed a wish to take a young convert into their home. I had been in Salt Lake about a week when I wrote to William Linford in Ogden and told him that “his” convert had arrived in the Valley. I had promised to do this at the time he finished his mission and left England. Martha, his wife, took the letter out in the fields of his farm where he was ploughing and he was so excited that he left the horses and plough in the field for Martha to unhitch and put away and hurried into the house to change. He drove his Model T Ford to Salt Lake to get me. It was Halloween Eve, and on our way back to Ogden, a terrible wind and rain storm came up. Telephone poles fell across the highway, trees were uprooted, barns blown over, and as we got to Will’s house in North Ogden, the wind whipped the top off his car. But he laughed and said that having me there in Zion was worth every bit of the storm. Their daughter, Elinor, was about my age and we loved each other from the start and have been like sisters ever since. I stayed with them a month then returned to my home with the Tolman’s. The Ward put me busy right away. Talking has always been a weakness of mine (mother always called me her chatterbox—she said I was born talking), so I spoke in Sacrament meeting. I told the congregation of my conversion and all that had happened in my life. I found lots of friends after the meeting and there was one young man I especially remembered. A few days later I was asked to help with the Ward census and was given a whole block to visit and gather names. In one of these homes, I again met John Weenig and he asked me if I would like to go to a movie. His sister later told me he had come home from the Sunday night meeting and told the family he had met the girl he was going to marry. He was twenty-eight and had not been too interested in girls. After gathering the census material, we talked in his home and he told me that he had been waiting for me to come into his life. John was a wonderful man, clean, good and kind, quite studious, always reading and learning, full of heart. He loved music and art and soon we learned to love each other. . . .
My dear John and I were married after ten months of courtship, on September 20, 1921, in the Salt Lake Temple and sealed by Apostle George F. Richards for time and all eternity. I don’t think I will ever forget that wonderful day in the Temple, the beautiful things I saw and heard and was promised. . . .
On July 17, 1922, a lovely daughter as fair as a lily and with blue eyes like her father was sent to us and we named her Joan Edith. Then a lovely grey-eyed, dark-haired little girl was born on February 13, 1924, whom we called Dorothy Martha. With two little girls to love we were completely happy and the years that followed were full of love and joy for me. We longed for a little boy and prayed to our Heavenly Father to send us one, but the years went by and no little boy came to live with us. . . .
My two daughters that were in [a] dream had been born to us, but no little son had come.6Grandma Weenig, who had been living with us, became quite ill and the night before she died, we talked and I asked her that when she went “home,” would she see that we got our little boy and she promised that she would try. Years went by and I began to worry, as Dorothy was now fifteen years old. One night before David was born, I had a dream (my John called me the dreamer). I saw Joan and Dorothy walking a little boy between them, each holding one of his hands. Not quite ten years after Grandma Weenig’s passing, David John was born on March 17, 1939. I have always felt that she sent our son to us. . . . He has been a wonderful son, of whom I am very proud. The years that followed were full of happiness. Joan and Dorothy married and had families of their own. . . .
Edith and John Weenig, 1930. I was happy at this time with the thought of going back to England for the Coronation of Elizabeth II, and after thirty-two years of waiting to see my brothers and sisters and my father. My dear mother had already passed on to heaven. David and his dad took care of themselves with Dorothy’s help while I was away and it was a glorious trip, but I became homesick for my own loved ones here in Zion and hurried back home again. Soon John’s health began to fail and he was in and out of the hospital. . . . Dorothy and her husband, Ronald, . . . were [in] Okinawa [Japan] with the United States Air Force . . . David was away taking his Army service training and our Joan was not well. It was discovered that she had multiple sclerosis and her body was fast becoming helpless. . . . John became very ill and x-rays showed that he had an aneurysm or blockage in the aorta, which was affecting his heart. He had to have immediate surgery to remove the blockage which weakened him terribly and in two days he left us to return home to his Heavenly Father.7 He was buried on December 21, 1959. My very life seemed to have ended, but with the help of my Father in Heaven, I finally emerged again. Edith and son, David John Weenig, 1942. Joan was becoming more weak and helpless as the weeks went by. Her Dad’s death had been hard on her, too, and with Dorothy so far away, it made it hard on all of us. I was so thankful that I had David with me. On March 1st, 1960, two and one-half months after her Dad left us, Joan died. It was a blessing for her, but it left us quite desolate. Yet it was a comfort to know that she was with her Dad. . . . I became quite ill and Dorothy was called home from Okinawa. David had married Carol Hansen in the Salt Lake Temple, so I knew he was well taken care of, so I took the doctor’s advice and arrangements were made for me to go to Okinawa and stay with Dorothy and Ronald. The newly-weds lived in my home and took care of it while I was gone. On this beautiful little island of Okinawa, I found peace and health. . . . 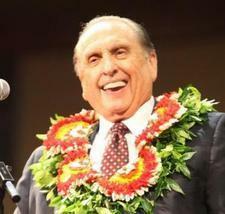 Soon after arriving, President Andrus, who was visiting the island for a conference, called me to perform a mission. He said the Relief Society was not functioning as it should and he wanted me to take over and help the young military wives. It took a lot of the sorrow out of my life. I felt God was indeed good to me to give me the chance to work in the Church on that beautiful island. . . .
On returning back to Salt Lake City in May 1961, I settled again in my home and got busy in the ward. Then I was called to become an ordained temple worker. This had been a great desire of mine for many years, so I was very happy to be called to work in the holy Temple. Paul patiently waited for me to come home and after much prayer, I decided to marry him. He has been so kind to me and his love has brought me happiness once again. Paul was called to be a Temple worker, too, and we have spent many happy years doing this work together. . . .
. . . . Life is full once more. David and Carol have four lovely little girls: Laura, Kathleen, Sarah Ann and Jennifer. [Granddaughter] Janet has a little daughter, Tiffani, and a sweet son, Jason, and all are near my home. I have ten grandchildren and seven great-grandchildren. Joining this great Church has indeed been a blessing to me. I thank my Heavenly Father for all the blessings that He has bestowed upon me. Any sacrifice I have had to make to become a member of His Church and Kingdom here on earth has brought me blessings a hundredfold. For my John and Paul, I thank Him from the bottom of my heart, and for my children, grandchildren and great-grandchildren, I will ever be grateful to Him. Edith Florence Papworth Weenig Tanner died on February 26, 1984, in Salt Lake City, Utah, at the age of eighty-four. Edith was a prolific letter writer to her family in England and Australia. In addition to her personal history,9 Edith left behind a large file of talks and lessons she gave, as well as poems she wrote. These traces of her past are part of the legacy of a very courageous and lovely woman. Touched by the Spirit from a young age, she adhered to the inspiration she received, even when doing so was difficult. In the process, she set a fine example of faith in the face of adversity. Learn more about the remarkable women who have shaped our Church in Women of Faith. 1. Albert Sidney was born January 26, 1910, in Abbots Ripton, Huntingdonshire, England, and died June 4, 1911, likely in Alconbury, Huntingdonshire, England. 2. William Amasa Linford (1879–1952) served in the British Mission from December 1915 to March 1918. He was married to Martha Poulsen Linford (1884–1951) in 1903, and they became the parents of six children. 3. The Church of Jesus Christ of Latter-day Saints, “Baptismal Certificate: Edith Florence Papworth,” December 2, 1917, holograph, private possession. 4. Edith served beginning in January 1918. Her Letter of Release is dated August 5, 1919. Unless dated incorrectly, these documents suggest that Edith was not formally released until her return to London from her parents’ home. The Church of Jesus Christ of Latter-day Saints, “Missionary’s Certificate: Edith Florence Papworth,” no. 376, January 13, 1918, holograph, private possession; The Church of Jesus Christ of Latter-day Saints, “Letter of Release: Edith Florence Papworth,” London Conference, August 5, 1919, holograph, private possession. 5. Drinking consecrated oil was a common practice among Latter-day Saints in the nineteenth and early twentieth centuries, perhaps because they considered it analogous to medicine. Church leaders later restricted the use of consecrated oil to anointing. Jonathan A. Stapley, “‘Pouring in Oil’: The Development of the Modern Mormon Healing Ritual,” in By Our Rites of Worship: Latter-day Saint Views on Ritual in Scripture, History, and Practice, ed. Daniel L. Belnap (Provo, UT: Religious Studies Center; Salt Lake City, UT: Deseret Book, 2013), 283–316. 6. Shortly after her marriage, Edith had a dream that she would have two girls and one boy. Edith Florence Papworth Weenig Tanner, “The Story of My Life,” n.d., typescript, p. 8, private possession. 7. John Weenig died December 17, 1959, in Salt Lake City, Utah. “John Weenig,” 1959 Utah Certificate of Death, no. 59–18–2857. 8. One of Edith’s favorite stories to share with her family was that her father told her before he died that she had made the right decisions in her life. Apparently, seeing how the gospel affected her life had a positive effect on him in the long run. 9. Edith’s personal history was pieced together from autobiographical notes that she had compiled over the years. The author and Edith sat together for many hours as they were carefully transcribed and threaded into a narrative. A granddaughter, Janet Cunningham, was also involved in this process.